The University is always striving to be different and its latest venture is very different. This is a first for a UK University. 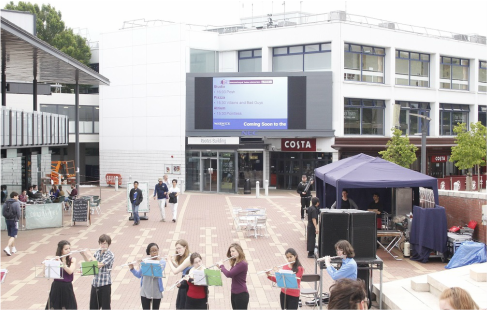 Warwick has put an LED video wall in the heart of its campus providing a sociable gathering place for students to enjoy music, sports and major TV events. The University of Warwick is one of the leading universities in the UK- consistently ranking high in league tables and enjoying an enviable reputation for excellence in research and teaching. Located in the central piazza, the new 17.5 sq.m LED screen enhances the campus experience and brings together different communities of students. We are confident that the students & visitors will benefit from seeing useful information displayed on the screen, as well as entertainment and art installations being showcased to bring the campus together. The University is also encouraging the students to put forward ideas for ways to use the screen, as well as design and submit content to use on the screen. The NEC 10mm Nichia LED modules deliver excellent uniformity of colour and brightness across the entire screen with wide horizontal and vertical viewing angles. With IP65 rating the screen is protected against the elements for outdoor use whilst delivering up to 6,000cd/m2 brightness for excellent viewing even in direct sunlight. The ambient light sensor will ensure optimum brightness levels whilst minimising power consumption. Designed for 24/7 operation, the high quality LED modules will deliver consistent performance even for heavy duty applications. The ability to view high-quality images of graduation ceremonies and sporting events has proved popular and has attracted a large audience to gather at the piazza.